For what if some did not believe? What is the Bible? Is it a book like any other intended for any occasional reader, who is expected to grasp at once its proper meaning? Rather, it is a sacred book addressed primarily to believers. Of course, a sacred book can be read by anyone as well, just ‘as literature.’ But this is rather irrelevant to our immediate purpose. We are concerned now not with the letter but with the message. St. Hilary put it emphatically: Scriptura est non in legendo, sed in intelligendo. [Scripture is not in the reading, but in the understanding.] Is there any definite message in the Bible, taken as a whole, as one book? And again, to whom is this message, if any, properly addressed? To individuals, who would be, as such, entitled to understand the book and to expound its message? Or to the community, and to individuals only in so far as they are members of that community? Whatever the origin of particular documents included in the book may have been, it is obvious that the book, as a whole, was a creation of the community, both in the old dispensation and in the Christian Church. The Bible is by no means a complete collection of all historical, legislative and devotional writings available, but a selection of some, authorized and authenticated by the use (first of all liturgical) in the community, and finally by the formal authority of the Church. And there was some very definite purpose by which this “selection” was guided and checked. “And many other signs truly did Jesus in the presence of his disciples, which are not written in this book. But these are written that ye might believe that Jesus is the Christ, the Son of God; and that believing ye might have life through his name”(John 20:30-31). The same applies, more or less, to the whole Bible. Certain writings have been selected, edited and compiled, and brought together, and then commended to believers, to the people, as an authorized version of the divine message. The message is divine; it comes from God; it is the Word of God. But it is the faithful community that acknowledges the Word spoken and testifies to its truth. The sacred character of the Bible is ascertained by faith. The Bible, as a book, has been composed in the community and was meant primarily for its edification. The book and the Church cannot be separated. The book and the Covenant belong together, and Covenant implies people. It was the People of the Covenant to whom the Word of God had been entrusted under the old dispensation (Rom. 3:2), and it is the Church of the Word Incarnate that keeps the message of the Kingdom. The Bible is the Word of God indeed, but the book stands by the testimony of the Church. The canon of the Bible is obviously established and authorized by the Church. One has, however, not to overlook the missionary background of the New Testament. “The Apostolic Preaching,” therein embodied and recorded, had a double purpose: the edification of the faithful and the conversion of the world. Therefore the New Testament is not a community-book in the same exclusive sense as the Old Testament surely was. It is still a missionary book. Yet it is no less fenced-off from the outsiders. Tertullian’s attitude to the Scriptures was typical. He was not prepared to discuss the controversial topics of the faith with heretics on the Scriptural ground. Scriptures belonged to the Church. Heretics’ appeal to them was unlawful. They had no right on foreign property. Such was his main argument in the famous treatise: De praescriptione haereticorum. An unbeliever has no access to the message, simply because he does not “receive” it. For him there is no “message” in the Bible. It was no accident that a diverse anthology of writings, composed at various dates and by various writers, came to be regarded as a single book. Ta biblia is of course plural but the Bible is emphatically singular. The scriptures are indeed one Holy Scripture, one Holy Writ. There is one main theme and one main message through the whole story. For there is a story. Or, even more, the Bible itself is this story, the story of God’s dealings with his chosen people. The Bible records first of all God’s acts and mighty deeds, Magnalia Dei. The process has been initiated by God. There is a beginning and an end, which is also a goal. There is a starting point: the original divine fiat — “in the beginning” (Gen. 1:1). And there will be an end:“even so come” (Rev. 22:20). There is one composite and yet single story — from Genesis to Revelation. And this story is history. There is a process going on between these two terminal points. And this process has a definite direction. There is an ultimate goal, an ultimate consummation is expected. Every particular moment is correlated to both terms and has thereby its proper and unique place within the whole. No moment therefore can be understood except in the whole context and perspective. God has spoken “at sundry times and in divers manners” (Heb. 1:1). He was revealing himself through ages, not once, but constantly, again and again. He was leading his people from truth to truth. There were stages in his revelation: per incrementa. This diversity and variety should not be ignored or overlooked. Yet it was ever the same God, and his ultimate message was ever the same. It is the identity of this message that gives to the various writings their real unity, despite the variety of manners. Different versions were taken into the book as they stood. The Church has resisted all attempts to substitute a single synthetic Gospel for four differing Gospels, to transform the Tetraevangelion into a Dia-tessaron, in spite of the difficulties implied in the “contradictions of the Evangelists” (with which St. Augustine was wrestling). These four Gospels did secure the unity of the message well enough, and perhaps in a more concrete form than any other compilation could afford. The Bible is a book about God. But the God of the Bible is not Deus absconditus, but Deus revelatus. God is manifesting and revealing himself. God intervenes in human life. And the Bible is not merely a human record of these divine interventions and deeds. It is a kind of divine intervention itself. It carries with itself a divine message. God’s deeds constitute themselves a message. No need therefore to escape time or history in order to meet God. For God is meeting man in history, i.e. in the human element, in the midst of man’s daily existence. History belongs to God, and God enters human history. The Bible is intrinsically historical: it is a record of the divine acts, not so much a presentation of God’s eternal mysteries, and these mysteries themselves are available only by a historical mediation. “No man hath seen God at any time; the only begotten Son, which is in the bosom of the Father, he hath declared him”(John 1:18). And he declared him by entering history, in his holy incarnation. Thus the historical frame of the revelation is not something that ought to be done away with. There is no need to abstract revealed truth from the frame in which revelations took place. On the contrary, such an abstraction would have abolished the truth as well. For the Truth is not an idea, but a person, even the Incarnate Lord. In the Bible we are struck by the intimate relation of God to man and of man to God. It is an intimacy of the Covenant, an intimacy of election and adoption. And this intimacy culminates in the incarnation. “God sent forth his Son, born of a woman, born under the law” (Gal. 4:4). In the Bible we see not only God, but man too. It is the revelation of God, but what is actually revealed is God’s concern about man. God reveals himself to man, “appears” before him, “speaks” and converses with him so as to reveal to man the hidden meaning of his own existence and the ultimate purpose of his life. In Scripture we see God coming to reveal himself to man, and we see man meeting God, and not only listening to his voice, but answering him too. We hear in the Bible not only the voice of God, but also the voice of man answering him — in words of prayer, thanksgiving and adoration, awe and love, sorrow and contrition, exultation, hope or despair. There are, as it were, two partners in the Covenant, God and man, and both belong together, in the mystery of the true divine-human encounter, which is described and recorded in the story of the Covenant. Human response is integrated into the mystery of the Word of God. It is not a divine monologue, it is rather a dialogue, and both are speaking, God and man. But prayers and invocations of the worshipping psalmist are nevertheless “the Word of God.” God wants, and expects, and demands this answer and response of man. It is for this that he reveals himself to man and speaks to him. He is, as it were, waiting for man to converse with him. He establishes his Covenant with the sons of men. Yet, all this intimacy does not compromise divine sovereignty and transcendence. God is“dwelling in light unapproachable” (1 Tim. 6.16). This light, however, “lighteth every man that cometh into the world” (John 1:9). This constitutes the mystery, or the “paradox” of the revelation. Revelation is the history of the Covenant. Recorded revelation, i.e. the Holy Scripture, is therefore, above all, history. Law and prophets, psalms and prophecies, all are included and, as it were, woven into the living historical web. Revelation is not a system of divine oracles only. It is primarily the system of divine deeds; one might say, revelation was the path of God in history. And the climax was reached when God entered history himself, and for ever: when the Word of God was incarnate and “made man.” On the other hand, the book of revelation is as well the book of human destiny. First of all, it is a book which narrates the creation, fall and salvation of man. It is the story of salvation, and therefore man organically belongs to the story. It shows us man in his obedience and in his obstinate rebellion, in his fall and in his restoration. And the whole human fate is condensed and exemplified in the destiny of Israel, old and new, the chosen people of God, a people for God’s own possession. The fact of election is here of basic importance. One people has been elected, set apart from all other nations, constituted as a sacred oasis in the midst of human disorder. With one people on earth only did God establish his Covenant and grant his own sacred law. Here only a true priesthood has been created, even though but a provisional one. In this nation only true prophets were raised, who spoke words inspired by the Spirit of God. It was a sacred, though hidden centre for the whole world, an oasis granted by God’s mercy, in the midst of a fallen, sinful, lost and unredeemed world. All this is not the letter, but the very heart of the Biblical message. And all this came from God, there was no human merit or achievement. Yet, all this came for the sake of man,“for us men and for our salvation.” All these privileges granted to the Israel of old were subordinate to the ultimate purpose, that of a universal salvation: “For salvation is of the Jews” (John 4:22). The redeeming purpose is ever universal indeed, but it is being accomplished always by means of separation, selection or setting apart. In the midst of human fall and ruin a sacred oasis is erected by God. The Church is also an oasis still, set apart, though not taken out of the world. For again this oasis is not a refuge or shelter only, but rather a citadel, a vanguard of God. There is a centre in the Biblical story, or a crucial point on the line of the temporal events. There is a new beginning within the process, which does not, however, divide or cut it into parts, but rather gives to it an ultimate cohesion and unity. The distinction between the two Testaments belongs itself to the unity of the Biblical revelation. The two Testaments are to be carefully distinguished, never to be confused. Yet they are organically linked together, not as two systems only, but primarily in the person of the Christ. Jesus the Christ belongs to both. He is the fulfiller of the old dispensation and by the same act that he fulfills the old, “the Law and the prophets,” he inaugurates the new, and thereby becomes the ultimate fulfiller of both, i.e. of the whole. He is the very centre of the Bible, just because he is the archē and the telos — the beginning and the end. And unexpectedly this mysterious identity of the start, the centre and the goal, instead of destroying the existential reality of time, gives to the time-process its genuine reality and full meaning. There are no mere happenings which pass by, but rather events and achievements, and new things are coming to existence, that which never existed before. “Behold I make all things new” (Rev. 21:5). The fullness of revelation is Christ Jesus. And the New Testament is history no less than the Old: the Gospel history of the Incarnate Word and the beginnings of church history, and the apocalyptic prophecy too. The Gospel is history. Historic events are the source and the basis of all Christian faith and hope. The basis of the New Testament is facts, events, deeds — not only teaching, commandments or words. 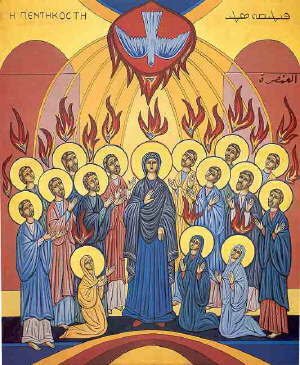 From the very beginning, from the very day of Pentecost, when St. Peter as an eye-witness (Acts 2:32: “whereof we are all witnesses,”martyres) witnessed to the fulfilment of salvation in the Risen Lord, apostolic preaching had emphatically an historical character. By this historical witness the Church stands. Creeds have an historical structure too, they refer to the events. Again, it is a sacred history. The mystery of Christ is precisely in that “in Him dwelleth all the fulness of the Godhead bodily” (Col. 2:9). This mystery cannot be comprehended within the earthly plane alone, there is another dimension too. But historical boundaries are not obliterated, not dimmed: in the sacred image historical features are dearly seen. Apostolic preaching was always a narrative, a narrative of what had really happened, hic et nunc. But what happened was ultimate and new: “The Word was made flesh” (John 1:14). Of course, the Incarnation, the Resurrection, the Ascension are historical facts not quite in the same sense or on the same level as the happenings of our own daily life. But they are no less historical for that, no less factual. On the contrary, they are more historical — they are ultimately eventful. They cannot obviously be fully ascertained except by faith. Yet this does not take them out of the historical context. Faith only discovers a new dimension, apprehends the historical datum in its full depth, in its full and ultimate reality. The Evangelists and the Apostles were no chroniclers. It was not their mission to keep the full record of all that Jesus had done, day by day, year by year. They describe his life and relate his works, so as to give us his image: an historic, and yet a divine image. It is no portrait, but rather an ikon — but surely an historic ikon, an image of the Incarnate Lord. Faith does not create a new value; it only discovers the inherent one. Faith itself is a sort of vision, “the evidence of things not seen” (Heb. 11:1: St. John Chrysostorn explains elenchos precisely asopsis). The “invisible” is no less real than “visible” — rather more real. “And yet no man can say that Jesus is the Lord, but by the Holy Ghost” (1 Cor. 12:3). It means that the Gospel itself can be apprehended in all its fulness and depth only in spiritual experience. But what is discovered by faith is given in very truth. The Gospels are written within the church. In this sense they are the witness of the Church. They are records of church experience and faith. But they are no less historical narratives and bear witness to what had really taken place, in space and in time. If “by faith” we discover much more than what can be detected “by senses,” this only discloses the utter inadequacy of “senses” in the knowledge of spiritual matters. For what had really happened was the mighty deed of the Redeeming God, his ultimate intervention in the stream of historical events. One should not divorce the “fact” and the “meaning” — both are given in reality. Revelation is preserved in the Church. Therefore, the Church is the proper and primary interpreter of revelation. It is protected and reinforced by written words; protected, but not exhausted. Human words are no more than signs. The testimony of the Spirit revives the written words. We do not mean now the occasional illumination of individuals by the Holy Ghost, but primarily the permanent assistance of the Spirit given to the Church, that is “the pillar and bulwark of the truth” (1 Tim. 3:15). The Scriptures need interpretation. Not the phrasing, but the message is the core. And the Church is the divinely appointed and permanent witness to the very truth and the full meaning of this message, simply because the Church belongs itself to the revelation, as the Body of the Incarnate Lord. The proclamation of the Gospel, the preaching of the Word of God, obviously belongs to the esse of the Church. The Church stands by its testimony and witness. But this witness is not just a reference to the past, not merely a reminiscence, but rather a continuous rediscovery of the message once delivered to the saints and ever since kept by faith. Moreover, this message is ever re-enacted in the life of the Church. Christ himself is ever present in the Church, as the Redeemer and head of his Body, and continues his redeeming office in the Church. Salvation is not only announced or proclaimed in the Church but precisely enacted. The sacred history is still continued. The mighty deeds of God are still being performed. Magnalia Dei are not circumscribed by the past; they are ever present and continued, in the Church and, through the Church, in the world. The Church is itself an integral part of the New Testament message. The Church itself is a part of revelation — the story of “the Whole Christ” (totus Christus: caput et corpus, in the phrase of St. Augustine) and of the Holy Ghost. The ultimate end of revelation, its telos, has not yet come. And only within the experience of the Church is the New Testament truly and fully alive. Church history is itself a story of redemption. The truth of the book is revealed and vindicated by the growth of the Body. We must admit at once that the Bible is a difficult book, a book sealed with seven seals. And, as time runs on, it grows no easier. The main reason for that, however, is not that the Book is written in an “unknown tongue” or contains some “secret words that man may not repeat.” On the contrary, the very stumbling-block of the Bible is its utter simplicity: the mysteries of God are framed into the daily life of average men, and the whole story may seem to be all too human. just as the Incarnate Lord himself appeared to be an ordinary man. The Scriptures are “inspired,” they are the Word of God. What is the inspiration can never be properly defined — there is a mystery therein. It is a mystery of the divine-human encounter. We cannot, fully understand in what manner “God’s holy men” heard the Word of their Lord and how they could articulate it in the words of their own dialect. Yet, even in their human transmission it was the voice of God. Therein lies the miracle and the mystery of the Bible, that it is the Word of God in human idiom. And, in whatever the manner we understand the inspiration, one factor must not be overlooked. The Scriptures transmit and preserve the Word of God precisely in the idiom of man. God spoke to man indeed, but there was man to attend and to perceive. “Anthropomorphism” is thus inherent in the very fact. There is no accommodation to human frailty. The point is rather that the human tongue does not lose its natural features to become a vehicle of divine revelation. If we want the divine word to ring clear, our tongue — is not to leave off being human. What is human is not swept away by divine inspiration, it is only transfigured. The “supernatural” does not destroy what is “natural”: hyper physin does not mean para physin. The human idiom does not betray or belittle the splendour of revelation, it does not bind the power of God’s Word. The Word of God may be adequately and rightly expressed in human words. The Word of God does not grow dim when it sounds in the tongue of man. For man is created in the image and likeness of God — this “analogical” link makes communication possible. And since God deigned to speak to man, the human word itself acquires new depth and strength and becomes transfigured. The divine Spirit breathes in the organism of human speech. Thus it becomes possible for man to utter words of God, to speak of God. “Theology” becomes possible — theologia, i.e. logos peri theou. Strictly speaking, theology grows possible only through revelation. It is the human response to God, who has spoken first. It is man’s witness to God who has spoken to him, whose word he has heard, whose words he has kept and is now recording, and repeating. Surely this response is never complete. Theology is ever in the process of formation. The basis and the starting point are ever the same: the Word of God, the revelation. Theology witnesses back to the revelation. It witnesses in divers manners: in creeds, in dogmas, in sacred rites and symbols. But in a sense Scripture itself is the primary response, or rather Scripture itself is at once both the Word of God and the human response — the Word of God mediated through the faithful response of man. There is always some human interpretation in any Scriptural presentation of the divine Word. So far it is always inescapably “situation-conditioned.” Is it ever possible for man to escape his human situation? The Church has summarized the Scriptural message in creeds, and in many other ways and methods. Christian faith has developed or grown into a system of beliefs and convictions. In any such system the inner structure of the basic message is shown forth, all particular articles of faith are presented in their mutual interdependence. Obviously, we need a system, as we need a map in our travels. But maps refer to a real land. And any doctrinal system too must be related to the revelation. It is of utter importance that the Church has never thought of her dogmatic system as a kind of substitute for the Scriptures. Both are to be kept side by side: a somewhat abstract or generalized presentation of the main message in a creed or in a system, and all particular documents referring to the concrete instances of revelation. One might say a system and the history itself. Here a problem arises: how, and to what extent, can history be framed into a system? This is the main problem of theological hermeneutics. What is the theological use of the Bible? How should the divers and concrete witnesses, covering hundreds of years, be used for the construction of a single scheme? The Bible is one indeed, and yet it is, in fact, a collection of various writings. We are not entitled to ignore that. The solution depends ultimately upon our conception of history, upon our vision of time. The easiest solution would have been indeed if we could simply overlook or overcome the diversity of times, the duration of the process itself. Such a temptation faced Christianity from an early date. It was at the root of all allegorical interpretations, from Philo and Pseudo-Barnabas to the new revival of allegorism in post-Reformation times. It was a permanent temptation of all mystics. The Bible is regarded as a book of sacred parables, written in a peculiar symbolical language, and the task of exegesis is to detect their hidden meaning, to detect the eternal Word, which happens to have been uttered in divers manners and under divers veils. The historical truth and perspective are irrelevant in this case. Historical concreteness is no more than a pictorial frame, a poetical imagery. One is in search of eternal meanings. The whole Bible would be then reconstructed into a book of edifying examples, of glorious symbols, which point out the supertemporal truth. Is not the truth of God ever the same, identical and eternal? In that mood, it is but natural to look in the Old Testament for the evidences of all distinctive Christian beliefs and convictions. Two Testaments are as it were melted into one, super-temporal, and their distinctive marks obliterated. The dangers and shortcomings of such a hermeneutical approach are too obvious to need an extensive refutation. But the only real remedy against this temptation would be the restoration of historical insight. The Bible is history, not a system of belief, and should not be used as a summa theologiae. At the same time, it is not history of human belief, but the history of the divine revelation. The basic problem remains, however, still unsolved: for what purpose do we need both system and history? By what reason and for what purpose did the Church keep them always together? Again, the easiest answer to this question is the least satisfactory: one may suggest at once that the Scriptures are the only authentic record of the revelation, and everything else is no more than a commentary thereupon. And commentary can never have the same authority as the original record. There is some truth in this suggestion, but the true difficulty we have to face is elsewhere. Why are not the earlier stages of the revelation superseded by the later ones? Why do we still need the law and the prophets even in the new covenant of Christ, and, to a certain extent, on the same level of authority as the Gospels and the rest of the New Testament writings? I mean, as chapters of the same unique book, as it were. For, obviously, they are included in the canon of Scripture, not as historical documents only, not as chapters on the stages of history already passed away. This applies particularly to the Old Testament. “For all the prophets and the law prophesied until John” (Matt. 11:13). Why do we still keep both the law and the prophets, and in what sense? What can be the right use of the Old Testament in the Church of Christ? First of all, it needs to be an historical use. Yet, again this history is a sacred history — not a history of human convictions and their evolution, but a history of the mighty deeds of God. And these deeds are not disconnected irruptions of God into human life. There was an intimate unity and cohesion. They led and guided the chosen people into God’s supreme purpose, unto Christ. Therefore, in a sense, the earlier ones were reflected, as it were, or implied in the later ones. There was a continuity of the divine action, as there was an identity of the goal and purpose as well. This continuity is the basis of what was called the “typological” interpretation. Patristic terminology was at that point rather fluent. Still, there was always a clear distinction between two methods and approaches. “Allegory” was an exegetical method indeed. An allegorist dealt primarily with the texts; he searched out the hidden and ultimate meaning of Scriptural passages, sentences and even particular words, behind and beneath “the letter.” On the contrary, “typology” was not an exegesis of the texts themselves, but rather an interpretation of the events. It was an historical, and not merely a philological method. It was the inner correspondence of the events themselves in the two Testaments that had to be detected, established and brought forward. A typologist looked not for the “parallels” or similarities. And not every event of the Old Testament has its “correspondence” in the New. Yet there are certain basic events in the old dispensation which were the “figures” or “types” of the basic events in the new. Their “correspondence” was of divine appointment: they were, as it were, stages of a single process of the redemptive Providence. In this manner “typology” was practiced already by St. Paul (if under the name of an “allegory”: Gal. 4:24: Hatina estin allegoroumena). There is an identical purpose of God behind all his mighty interventions, and in full it has been revealed in Christ. St. Augustine put it very clearly: “in ipso facto, non solum in dicto, mysterium requirere debemus [We ought to seek the mystery not just in word, but in the fact itself] (in ps. 68, sermo, 2, 6). And “the mystery” of the Old Testament was Christ; not only in the sense that Moses or the prophets “spoke” of him, but primarily because the whole stream of sacred history was divinely oriented towards him. And in this sense he was the fulfilment of all prophecies. For that reason, it is only in the light of Christ that the Old Testament can be properly understood and its “mysteries” unveiled — they were, in fact, unveiled by the coming of him “who should come.” The true prophetic meaning of the prophecies is clearly seen only, as it were, in retrospect, after they have been actually fulfilled. An unaccomplished prophecy is always dim and enigmatic (so are the prophecies of the Book of Revelation, which point to what is still to come, “at the end”). But it does not mean that we simply put arbitrarily a new meaning into the old text: the meaning was there, though it could not yet be seen clearly. When, for instance, we, in the Church, identify the Suffering Servant (in the Book of Isaiah) as Christ the crucified, we do not simply “apply” an Old Testament vision to a New ‘Testament event: we detect the meaning of the vision itself, although this meaning surely could not have been clearly identified in the times preceding Christ. But what had been first just a vision (i.e. an “anticipation”) has become an historical fact. Another point is of utter importance. For an “allegorist” the “images” he interprets are reflections of a pre-existing prototype, or even images of some eternal or abstract “truth.” They are pointing to something that is outside of time. On the contrary, typology is oriented towards the future. The “types” are anticipations, pre-figurations; their “prototype” is still to come. Typology is thus an historical method, more than a philological one. It presupposes and implies intrinsically the reality of history, directed and guided by God. It is organically connected with the idea of the covenant. Here the past, the present and the future are linked in a unity of divine purpose, and the purpose was Christ. Therefore typology has emphatically a Christological meaning (the Church is included here, as the Body and the Bride of Christ). In practice, of course, a true balance was never strictly kept. Even in patristic use typology was variously contaminated by allegorical deviations or accretions, especially in the devotional and homiletic use. What is, however, of importance is that in the catechetical tradition of the Early Church, closely related to the administration of the sacraments, this balance was always kept. This was the tradition of the Church, and deviations were due more to the curiosity or imagination of individual scholars. The Church was, in full sobriety, historically minded. Along with a presentation of the doctrine (i.e. a system) the Holy Bible was always read in the churches, with the deliberate purpose of reminding the faithful of the historical basis and background of their faith and hope. St. Augustine suggested that the prophets spoke of the Church even more clearly than of Christ himself, i.e. of the Messiah (in ps. 30.2, enarratio, 2, M.L., 36, 244). In a sense, this was only natural. For there was already a Church. Israel, the chosen people, the people of the covenant, was much more a Church than a nation, like other “nations.” Ta ethne, nationes or gentes — these kindred terms were used in the Bible (and later) precisely to describe the heathen or pagans in contrast to the only nation or people that was also (and primarily) a Church of God. The Law was given to Israel just in her capacity as a Church. It embraced the whole life of the people, the “temporal” as well as the “spiritual,” precisely because the whole of human existence had to be regulated by the divine precepts. And the division of life into “temporal” and “spiritual” departments is, strictly speaking, precarious. In any case, Israel was a divinely constituted community of believers, united by the Law of God, the true faith, sacred rites and hierarchy — we find here all elements of the traditional definition of the Church. The old dispensation has been, accomplished in the new, the covenant has been reconstituted, and the old Israel was rejected, because of her utter unbelief: she missed the day of her visitation. The only true continuation of the old covenant was in the Church of Christ (let us remember that both terms are of Hebrew origin: the Church is qahal and Christ means Messiah). She is the true Israel, kata pneuma. In this sense already St. Justin emphatically rejected the idea that the Old Testament was a link holding together the Church and the Synagogue. For him the opposite was true. All Jewish claims were to be formally rejected: the Old Testament no longer belonged to the Jews, as they had not believed in Christ Jesus. The Old Testament belonged now to the Church alone. Nobody could any longer claim Moses and the prophets, if he was not with Jesus the Christ. For the Church was the New Israel and the only heir of the promises of old. A new and important hermeneutical principle was implied in these rigoristic utterances of the early Christian apologist. The Old Testament was to be read and interpreted as a book of the Church. The book on the Church, we should add. The Law was superseded by the truth, and in it has found its accomplishment, and thereby was abrogated. It no longer had to be imposed upon the new converts. The New Israel had its own constitution. This part of the Old Testament was antiquated. It proved to be basically “situation-conditioned” — not so much in the sense of a general historical relativity as in a deeper providential sense. The new redemptive situation had been created or inaugurated by the Lord: a new situation in the sacred perspective of salvation. Everything that belonged essentially to the previous stage or phase had now lost its meaning, or rather kept its meaning as a prefiguration only. Even the Decalogue perhaps was not exempt from this rule and was overruled by the “new commandment.” The Old Testament is now to be used solely in its relation to the Church. Under the old dispensation the Church was limited to one nation. In the new all national discriminations are emphatically abrogated: there is no more distinction between a Jew and a Greek — all are indiscriminately in the same Christ. In other words, one has no right to isolate certain elements of the old dispensation, apart from their immediate relation to the life of the Church, and set them as a Scriptural pattern for the temporal life of the nations. The old Israel was a provisional Church, but she was not a pattern nation. One may put it this way. Obviously, we can learn a lot from the Bible on social justice — this was a part of the message of the Kingdom to come. We can learn a lot about a particular political, social and economic organization of the Jews through the ages. All that may possibly be of great help in our sociological discussions. And yet it is hardly permissible to detect in the Bible (viz. in the Old Testament) any permanent or ideal pattern of political or economic settlement for the present or for any other historical realm at all. We may learn quite a lot from Hebrew history. This will, however, be only a historical lesson, not a theological one. Biblical fundamentalism is no better in sociology than anywhere else. The Bible is no authority on social science, as it is no authority on astronomy. The only sociological lesson that can be extracted from the Bible is precisely the fact of the Church, the Body of Christ. But no reference to the Bible in “temporal” affairs can be regarded as a “Scriptural evidence.” There are “Scriptural evidences” only in theology. It does not mean that no guidance whatever can be found or even sought there in the Bible. In any case, such a search will not be a “theological use” of the Bible. And perhaps the lessons of the old Hebrew history are on the same level as any other lessons of the past. We have to distinguish more carefully between what was permanent and what was but provisional (or “situation-conditioned”) in the old covenant (and first of all we have to overcome its national limitations). Otherwise we would be in danger of overlooking what was new in the new covenant. In the New Testament itself we have to make a clear distinction between its historical and prophetical aspects too. The true theme of the whole Bible is Christ and his Church, not nations or societies, nor the sky and the earth. The old Israel was the “type” of the new, i.e. of the Church Universal, not of any particular or occasional nation. The national frame of the provisional Church has been done away by the universality of salvation. There is, after Christ, but one “nation,” the Christian nation, genus Christianum — in the ancient phrase, tertium genus — i.e. precisely the Church, the only people of God, and no other national description can claim any further Scriptural warrant: national differences belong to the order of nature and are irrelevant in the order of grace. The Bible is complete. But the sacred history is not yet completed. The Biblical canon itself includes a prophetical Book of Revelation. There is the Kingdom to come, the ultimate consummation, and therefore there are prophecies in the New Testament as well. The whole being of the Church is in a sense prophetical. Yet, the future has a different meaning postChristum natum. The tension between present and future has in the Church of Christ another sense and character than it had under the old dispensation. For Christ is no more in the future only, but also in the past, and therefore in the present also. This eschatological perspective is of basic importance for the right understanding of the Scriptures. All hermeneutical “principles” and “rules” should be re-thought and re-examined in this eschatological perspective. There are two major dangers to be avoided. 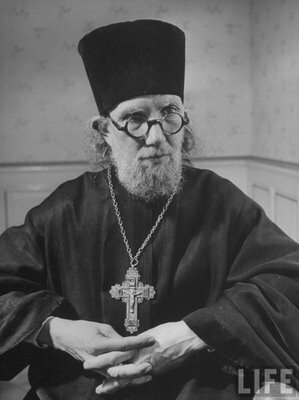 On the one hand, no strict analogy can be established between the two Testaments, their “covenantal situations” being profoundly different: they are related as “the figure” and “the truth.” It was a traditional idea of patristic exegesis that the Word of God was revealing himself continuously, and in divers manners, throughout the whole of the Old Testament. Yet all these theophanies of old should never be put on the same level or in the same dimension as the incarnation of the Word, lest the crucial event of redemption is dissolved into an allegorical shadow. A “type” is no more than a “shadow” or image. In the New Testament we have the very fact. The New Testament therefore is more than a mere “figure” of the Kingdom to come. It is essentially the realm of accomplishment. On the other hand, it is premature to speak of a “realized eschatology,” simply because the very eschaton is not yet realized: sacred history has not yet been closed. One may prefer the phrase: “the inaugurated eschatology.” It renders accurately the Biblical diagnosis — the crucial point of the revelation is already in the past. “The ultimate” (or “the new”) had already entered history, although the final stage is not yet attained. We are no more in the world of signs only, but already in the world of reality, yet under the sign of the Cross. The Kingdom has been already inaugurated, but not yet fulfilled. The fixed canon of Scripture itself symbolizes an accomplishment. The Bible is closed just because the Word of God has been incarnate. Our ultimate term of reference is now not a book, but a living person. Yet the Bible still holds its authority — not only as a record of the past, but also as a prophetical book, full of hints, pointing to the future, to the very end.